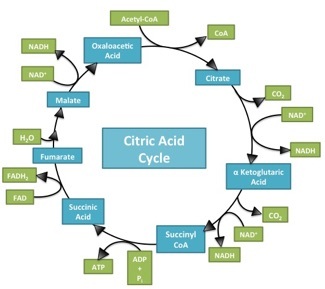 What makes the Citric Acid Cycle (Kreb’s cycle, TCA cycle) ‘hard’? Misdirection. When most of us sit down to learn something, the first question is usually “what is important here”. When trying to figure out a complicated process (Americans: think about the sport of cricket! ), the questions are “What should I be looking at? And what am I seeing when I look there?”. 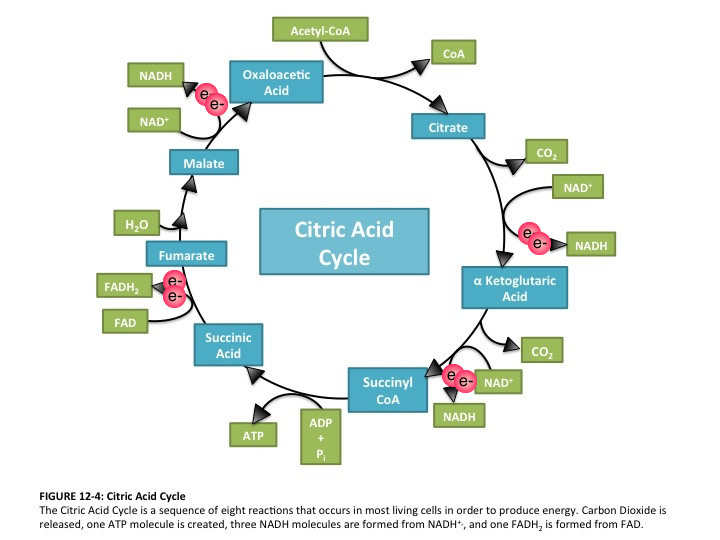 It’s deeply ironic, then, that in looking at Introductory Biology textbooks, it’s incredibly difficult to spot an electron anywhere in representations of the citric acid cycle. This is bizarre, in that the cycle has only two jobs: 1) extract ‘high value’ (energetic) electrons, and 2) be a cycle so it can keep… cycling. A call for electron-watching and some suggestions for teaching electron flow through the citric acid cycle follow (Image source)Navigating the complexity of unhelpfully named, multi-component happenings (“Citric Acid cycle”, “oxidative phosphorylation”, “Calvin cycle”, “photophosphorylation”) without a lifeline is foolishness. What’s needed are signposts centered on “why” rather than “what”. Each of those listed above are involved in energy transactions. This posts looks at who has the energy, where is it going, and why are there so many bloody steps? Everybody knows that sugar packs a mighty punch. Depending on your accounting, you can extract 32-38 ATP molecules from each molecule of sugar if you play your cards right (i.e. if you play in an oxygen environment and have a mitochondrion handy!). So why isn’t sugar the ‘energy currency of the cell’? Because extracting that energy is tough–you NEED that mitochondrion. Can you imagine how ridiculous the cell would look if each enzyme had to drag around a personal mitochondrion in order to power it to do its business? Yeah, no. ATP may hold only a fraction of sugar’s energy ‘value’, but accessing that energy is quick and easy–indeed, most powered enzymes in the cell ‘know how’. So–just where is the energy in sugar? Those electrons locked in carbon-carbon and carbon-hydrogen covalent bonds are little sparks of potential energy. Here’s irony for you: students are often told that ATP has “high energy bonds”, which is a bit of gibberish–breaking the bonds liberates the potential energy of the opposed negative charges of the phosphates, but the bonds themselves are garden variety shared electrons. 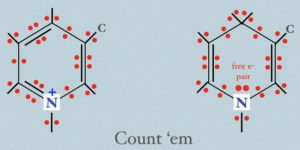 In glucose, we never talk about the bonds, but there’s biologically valuable ‘energy’ in electrons that are shared equally between atoms of similar electronegativity (C-C, C-H). Notice that there are NO ‘valuable’ electrons (no C-H or O-H bonds) on the right side? Someone has had their hand in the cookie jar! Before plunging forward, we need to establish that what’s ‘going on’ with NAD+ <=> NADH is gaining and losing electrons. Don’t fall for that proton (H+)–it’s a distraction. The key question is: “Does one of these forms have more electrons than the other?” And the answer is yes. Just intuitively, it should be so from the representation–we take a molecule with a positive charge (NAD+) and add a proton (H+); how then do we end up with a neutral molecule unless we add a pair of negative charges… most conveniently done in the form of electrons? In the image above, all the electrons in the critical part of NAD+/NADH are explicitly shown. Go ahead–count them… I dare you. If you count the way I do, you’ll see 30 on the left and 32 on the right… So you’re looking at NADH ‘carrying’ electrons on the right side. What the diagram doesn’t show you, but which is equally critical, is that those electrons are in relatively ‘high energy’ states, just like the were when ripped out of some other molecule. 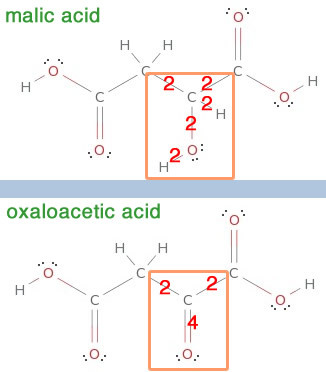 Again, the proof is there–in changing from magic acid to oxaloacetic acid, two electrons are stolen! And the culprit is NADH, which now heads off to the electron transport chain, where the poor things will be forced to labor at pulling protons across a membrane, and then finally dumped off to create a water molecule (look at the very end of your diagrams of an electron transport chain).